Selecting a new marketing agency is one of the most important decisions a company will make. A new resource is now available to help brands and companies understand the best practices needed for successfully identifying and selecting a marketing agency partner. 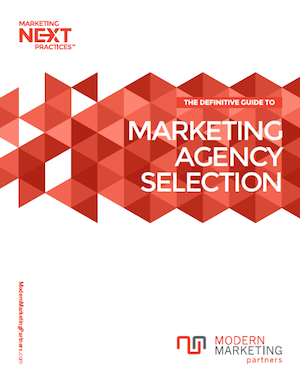 The Definitive Marketing Agency Selection Guide outlines 11 agency types, details a 4-step selection process, identifies key reasons for hiring and firing agencies, and provides several other valuable resources. Our friends from the Amalgamated Marketing Agency Network, an independent network of specialist agencies, have launched this must-read guide for any brand or company in search of a marketing agency of any type. Planning the Agency Search: How to develop an Agency RFP, decide on a budget, and devise selection criteria. How to Identify Agencies: Depending on your needs, your scope of agencies to select can vary. Different agencies are better at different things. Learn who best suits your needs and fits your budget. Vetting Agency Candidates: How do you develop a long list? A short list? What questions do you ask? Making the Final Agency Decision: After developing a short list, how do you make your final decision? As an active member of the Amalgamated Network, Modern Marketing Partners invites you to download this whitepaper on the Amalgamated website under the Marketing Agency Selection Guide. Please comment and share this information with associates in search of agency partners.